“The city of Paris has a great mast, made entirely of bronze, with sculpted Victories and Napoleon as its lookout”. Such were Balzac’s words on the Vendôme column, the obelisk which throughout the 19th century was seen as the most important symbol of Paris and upon which each government attempted to make its mark. Its chequered history is as much the history of 19th-century France. In March and June 1800, two decrees were passed ordering the erection of ‘a column dedicated to the heroes of each department’ in all the principal towns of France. Two columns were planned for Paris: one, a national column, to be set in the Place de la Concorde, the other, departmental, for the Place Vendôme. 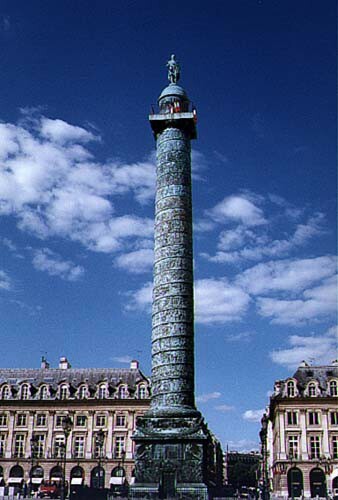 Nothing being done, the idea was re-proposed by the First Consul in 1803, confirming the erection of a column in Place Vendôme ‘equalling that in Rome set up in honour of Trajan’. The obelisk itself was to be decorated with 108 friezes climbing spiralwards, representing the departments, and topped with a statue of Charlemagne. In 1805, the day after Austerlitz, Vivant Denon, the Director of Museums, proposed that a commemorative column be erected dedicated to the Grande Armée, using the cannons taken from the Austrians. A decree of 1806 confirmed this proposal. Astutely, Denon abandoned the idea of a column dedicated to Charlemagne, deciding rather on a ‘German’ column on which ‘the recent campaign’ was to be ‘set in bronze on an eight hundred and thirty foot bas-relief frieze, representing the memorable campaign of 1805, just as the expedition against the Dacians was carved into Trajan’s Column’. The column was designed by Lepère and Gondoin and received many different names – first the ‘Austerlitz Column’, then the ‘Victory Column’ finally becoming the ‘Colonne de la Grande Armée’. Lepère supervised the melting down of the 1200 artillery pieces taken from the Russians and Austrians. The following inscription was engraved on the abacus of the capital: ‘Monument erected to the glory of Napoleon the Great’s Grande Armée, begun on 25 August 1806 and finished 15 August 1810’. The column comprises a stone core enrobed with 425 bronze plaques fixed to the stone with pins. A 280 metre-long frieze of bas-reliefs, designed from drawings by Bergeret, winds round the column depicting the major events of the campaign – from the camp in Boulogne to the return of the Emperor and his guard in 1806. A team of sculptors (including Boizot, Bosio, Bartolini, Ramey, Rude, Corbet, Clodion and Ruxthiel) was commissioned to execute the frieze. Forty-two metres tall, the column was crowned with a statue commissioned from Chaudet of The Emperor in Roman dress. The statue was taken down by the Allies in 1814 and replaced during the Restoration by a flag bearing fleurs de lys. Under the July Monarchy this was replaced with a statue by Seurre showing Napoleon as ‘Little Corporal’, a statue today held in the Invalides. During Second Empire, a copy of Chaudet’s initial statue designed by Dumont was hoisted to the top of the column to replace that by Seurre. Dismantled during the Commune at the instigation of Gustave Courbet, the Vendôme column was restored and re-erected once more in 1873; a court case directed the costs for this to Courbet himself, though he was to die before payment could be made.